The numeral “20” in the lower right hand corner of the front of a US $20 bill shifts from copper to green when tilted. Though color-shifting ink can be difficult to reproduce, skilled counterfeiters can mimic this quality. Therefore, the presence of color-shifting ink does not independently guarantee that currency is genuine. Microprinting is difficult to reproduce without very expensive, quality printers, but unfortunately, many counterfeiters have made the investment. 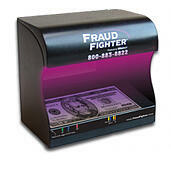 Most of the serious counterfeiters use off-set printers which are similar to printers on which genuine dollars are printed and are able to reproduce these effects. Also, consider what steps are necessary to authenticate microprinting. Really, a magnifying glass is required. Imagine the effect on your customers if your cashiers were bent over the notes with a magnifier every time they take a US banknote! When held up to light, you can see a watermark of Andrew Jackson on $20 bills. The watermark is embossed in the paper that the bill was printed on, so it can be seen from both sides. 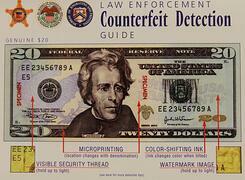 Some counterfeit bills may make use of watermark-printing applications available on many digital printers these days. These counterfeits may have the image faintly printed instead of watermarked. Other counterfeiters may use a technique that (somewhat) bypasses the watermark problem. They "wash" $5 bills (which have watermarks) to extract the ink and then print $20 over the blank $5 bill paper. This technique can make strikingly similar bills that look and feel real. However, if you look closely, the a phony $20 washed from a $5 has the watermark of Abraham Lincoln instead of Andrew Jackson. Each $20 bill produced after 2003 contains a plastic strip embedded along its left hand side. When held up to the light you can see “USA TWENTY” and an American flag. Moreover, when placed under ultraviolet light from a counterfeit detector, the security thread glows in green. Unfortunately, criminals have found a way to replicate security strips. Counterfeiters in Peru are so detailed that they have developed a technique to duplicate the security strip. They thread a bogus security strips into the bills by hand with the aid of a needle, and then secure it using glue dispensed by a medical syringe. Unlike older versions, new $20’s contains green, peach, and blue ink in their background. It is also important that there are small blue and red microfibers embedded in the paper. These blue and red fibers are not printed on the surface of the note, but are an integral part of the paper. Counterfeit for older bills bypass this problem using the money washing technique described earlier, while others use recycled paper from newspaper and couple this with off-set printing technology. It can be nearly impossible to spot high quality counterfeit currency using only your eyes because many counterfeiters have honed their craft and are able to meticulously create reasonable facsimiles of the real-thing. Fortunately, counterfeit detectors employ comprehensive analytical techniques that even "supernotes" can't fool to ensure the authenticity of your bills. 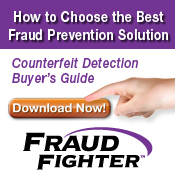 If you want to protect your business and have peace of mind that every bill you receive is genuine, you should invest in a counterfeit detector that fits the requirements of your unique transaction environment.